Every once in a while I pull a surprise meal and we have “breakfast for supper”. The events last weekend provided me with just such an opportunity. We had plans for Sunday that would have included a meal but at the last minute they were unexpectedly cancelled . I was then faced with the need to come up with a meal that I had not planned for. So, breakfast for supper was the perfect solution. Running in parallel was my desire to incorporate more citrus into our diet. So I came up with this idea for adding grated orange zest to my waffle batter and making an orange compote to spoon over the top. 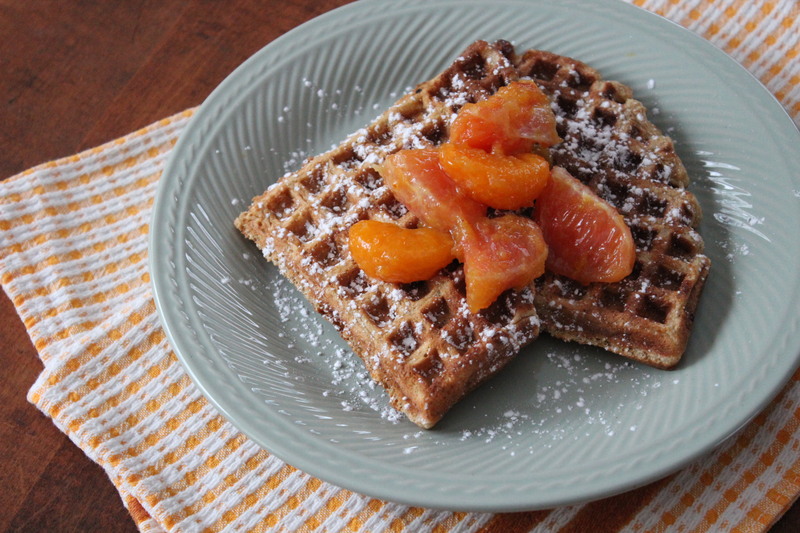 Brilliant, if I do say so myself 🙂 I like to add some whole wheat flour to waffles as another way to get in some fiber, and I also added some wheat germ. Buttermilk makes waffles nice and light if you have some, but you can sour milk and get the same results just by adding a little vinegar to the amount of milk called for. A non-stressful Sunday evening supper that turned out better than I expected. 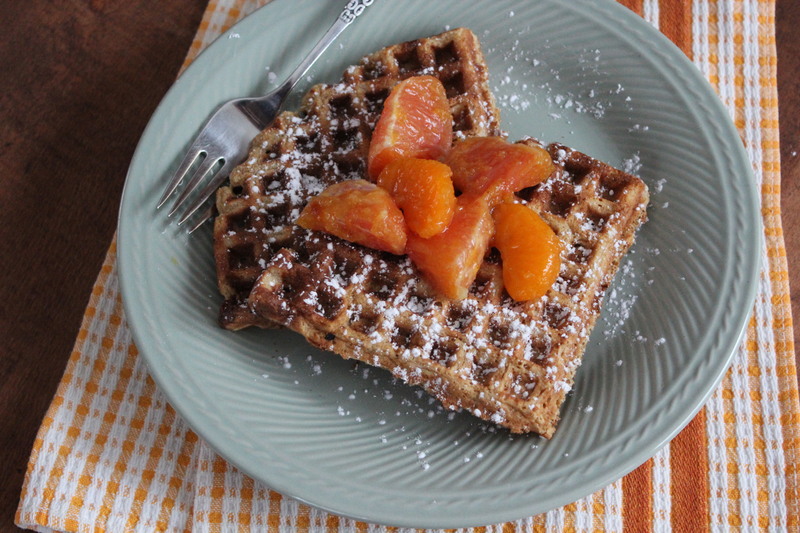 Make the compote first and keep warm while you make the waffles. 2 cups fresh orange sections, or any combination of orange and grapefruit. I used a Cara Cara orange, a navel orange and a clementine. 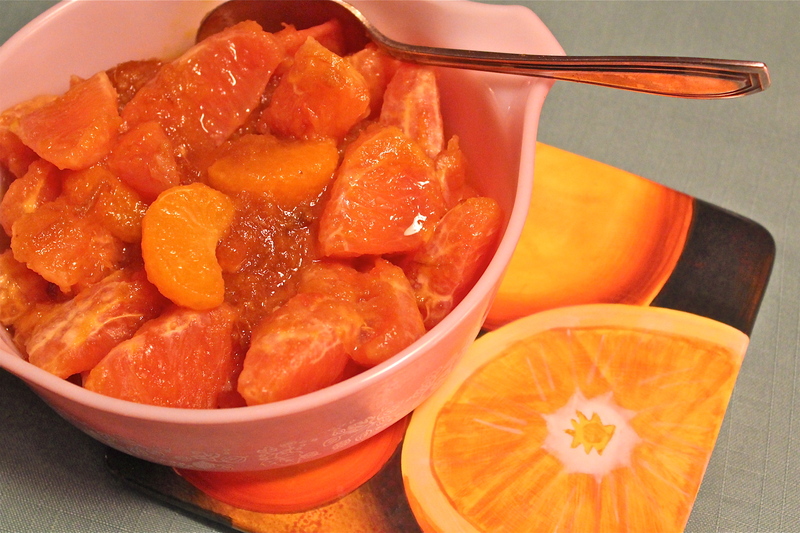 To prepare compote: place first 4 ingredients in a small saucepan over medium heat; cook 2 minutes until marmalade melts. 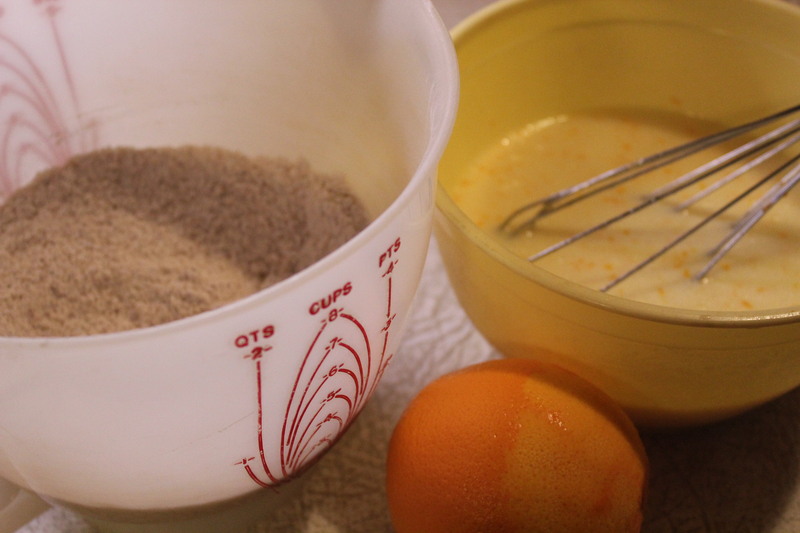 Reduce heat, and gently stir in orange sections; keep warm. 1. To prepare the waffles: lightly spoon both flours into a bowl. Add brown sugar through nutmeg and stir with a whisk. 2. 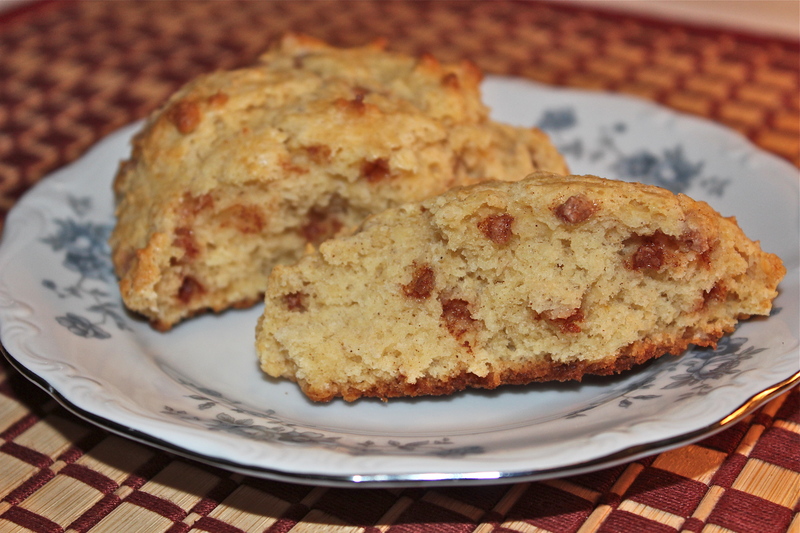 Combine buttermilk and next ingredients through egg. Add this mixture to the flour mixture, stirring just until moist. Wet and dry ingredients ready to be combined. 3. 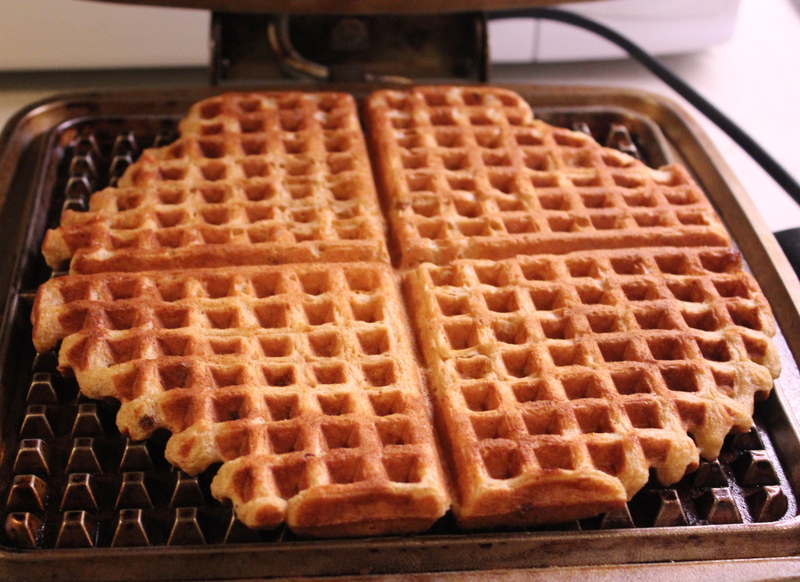 Coat a waffle iron with cooking spray and preheat it. Spoon batter onto hot waffle iron, spreading out to edges. Cook 5 minutes or until steaming stops. Repeat with remaining batter, keeping waffles warm in a low oven until ready to serve. 4. 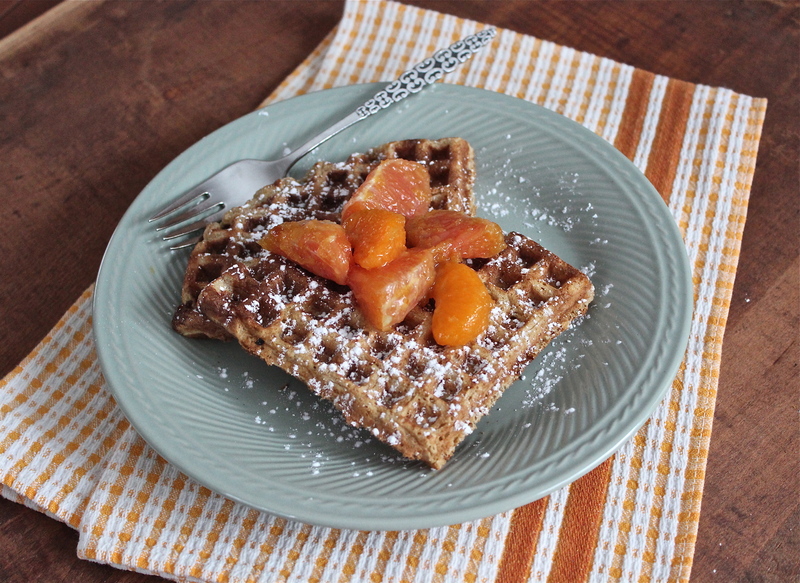 Sift powdered sugar over tops of waffles and serve with warm orange compote. Maple syrup tastes really good on them as well! One of the members of our family just celebrated a milestone birthday—80 years young! We had a large party with family and friends which was a lot of fun. When brainstorming ideas for what I was going to bring, the thought of making a special cocktail hit me. Our guest of honor is adventurous and fun loving so I thought “why not?” I knew I wanted to incorporate a citrus flavor; but lemon and orange are pretty commonly used in cocktails, so when I found this recipe using grapefruit, I knew right away it was the one! This is a very refreshing drink that is easy to fall in love with. 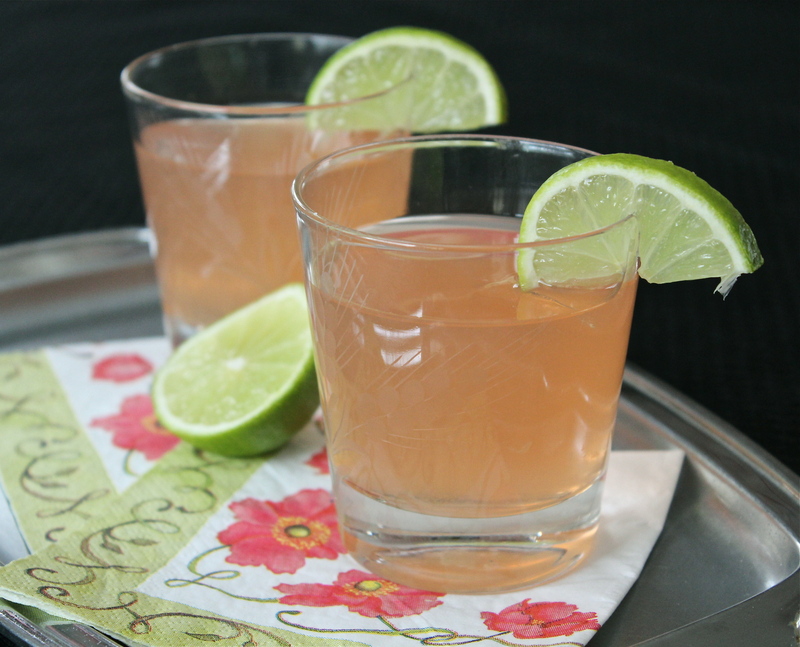 The Paloma, pronounced, PAH-LOW-MAH, is simply made of tequila, lime juice, and grapefruit soda. 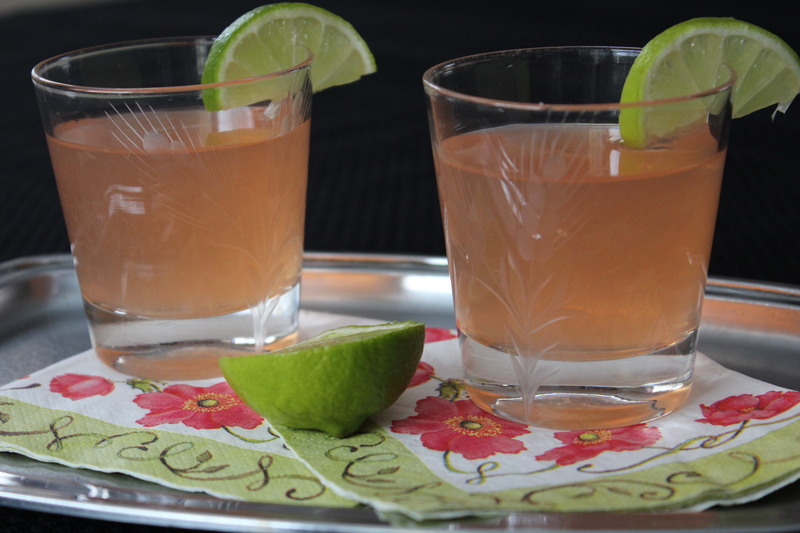 It’s worth using a good quality tequila, so that the lime and grapefruit flavors will mingle with and enhance the flavor of the tequila, rather than over power it. 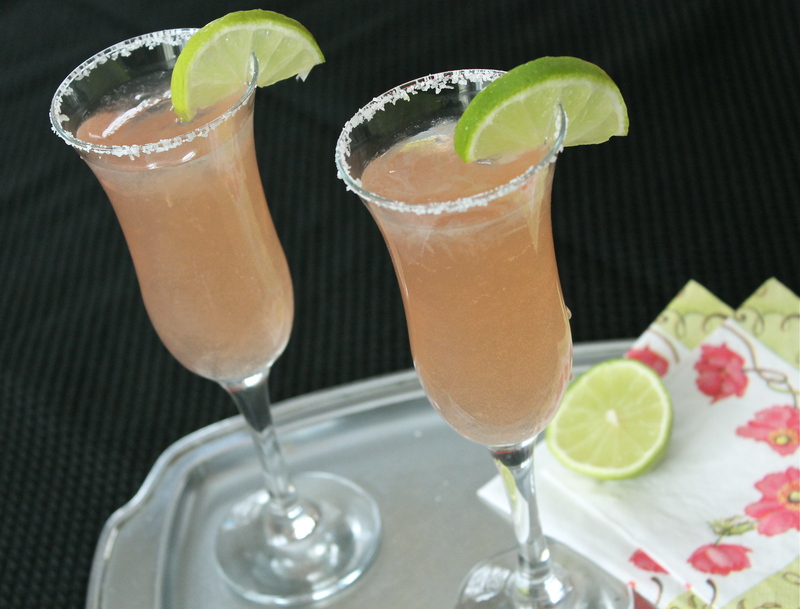 The flavors of grapefruit and lime are so refreshing. 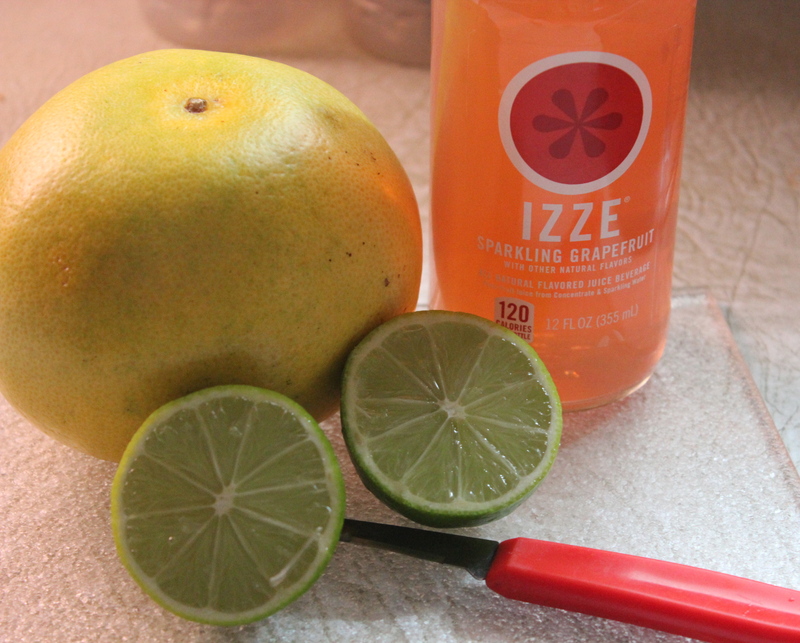 Izze is an excellent soda to use because it has lots of carbonation, and is not too sweet. If you are not able to find this soda in your supermarket, you may use a half and half mixture of pink grapefruit juice and plain soda water. This works well as a good substitute. 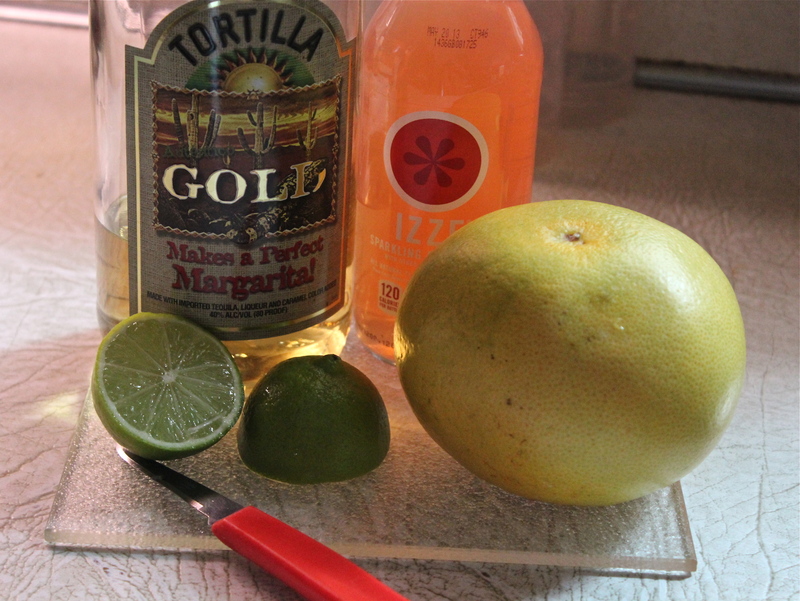 The proportions are basically equal parts tequila and soda, or even a little less soda so the taste of the tequila comes through, and the juice of half a lime. Add a pinch of Kosher salt if you wish or rim the glass with a little soda, then dip into salt before pouring in the cocktail. 1. Combine all the ingredients in a cocktail shaker, and mix to combine. 2. 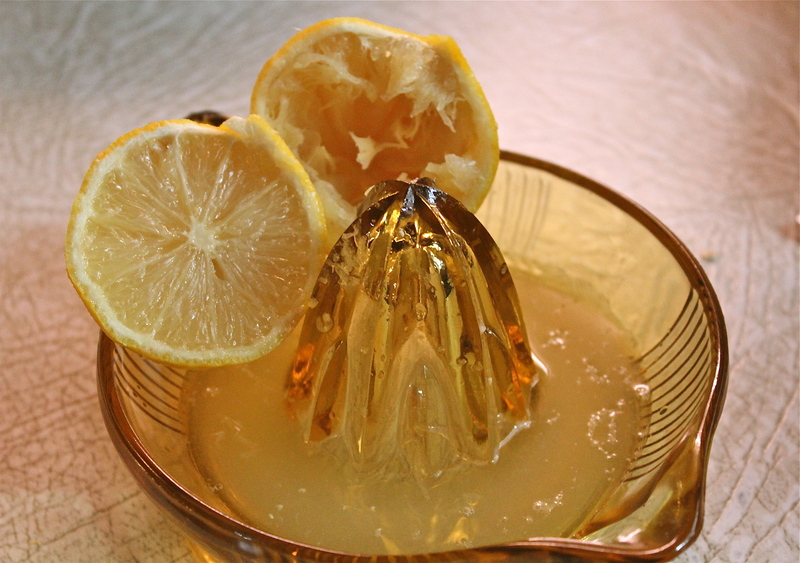 Moisten the rim of a beautiful glass with a little soda, then dip into salt. Add ice. Pour in cocktail. The drinks have gotten a little tipsy . 3. If it’s hot where you are, you are about to sip one of the most refreshing cocktails you have ever had. 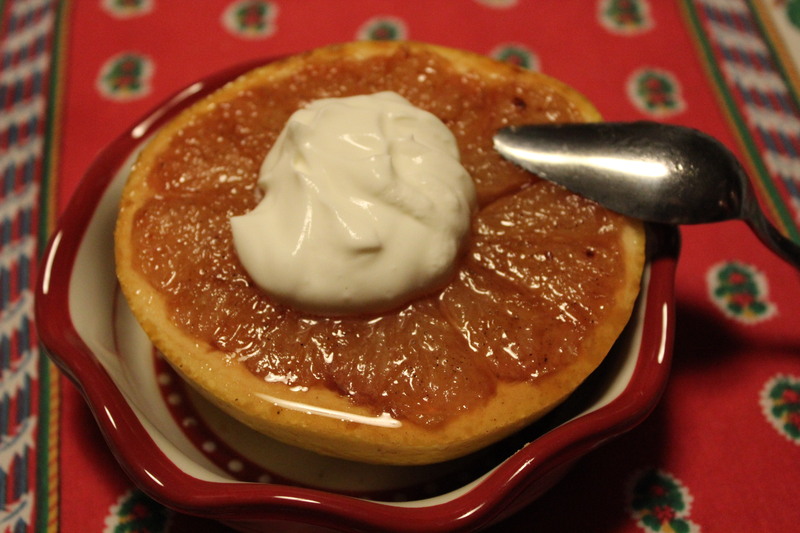 Staying with the subject of citrus fruits I thought I would include this simple little recipe–which hardly needs a recipe at all to make, but maybe some of you have never given a thought to heating up or broiling grapefruit. When my children were small I would cut grapefruits in half, section them, sprinkle the tops with granulated sugar, and place under the broiler until the sugar melted and became a little browned. Before serving I would place a whole maraschino cherry in the center. They loved it. We had it for breakfast, but who’s to say you couldn’t have it as a dessert as well. My recipe today is very similar to that described above, with just a few more ingredients. 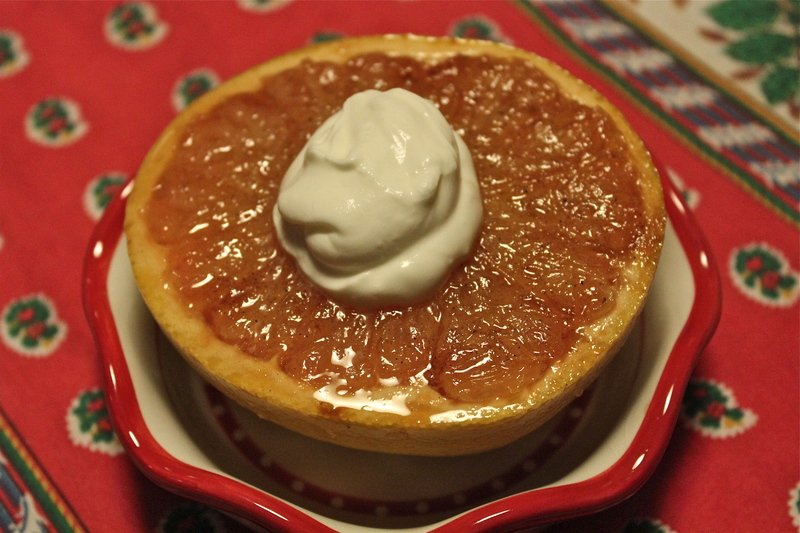 These grapefruit halves are topped with a spiced brown sugar, caramelized under the broiler then topped with a dollop of vanilla infused whipped cream. It seems more appropriate as a dessert because of the cream on it; but there’s no right or wrong way to have it. What’s important is that you get as much citrus as you can into your diet while it’s so plentiful. It is one of the best sources of Vitamin C. and also a good source of Vitamin A. 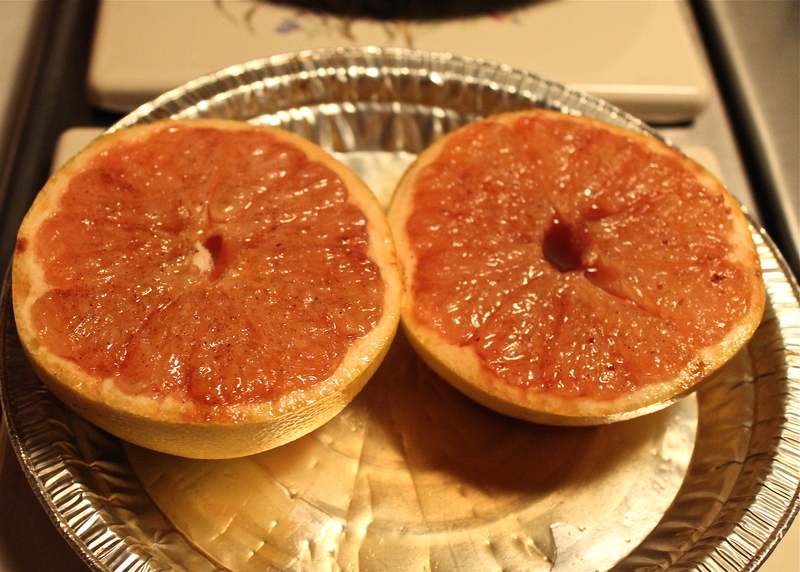 These grapefruit were so juicy, and sweet. 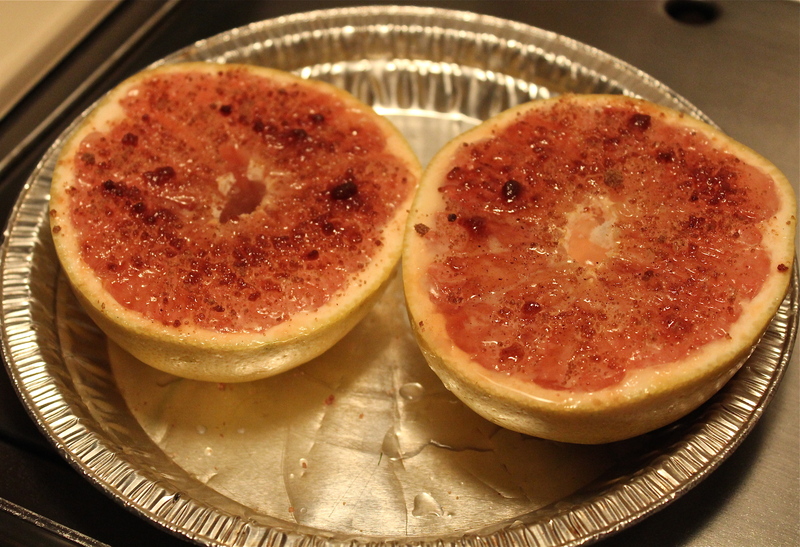 I used cardamom as the spice mixed with the brown sugar and it gave an interesting flavor to the grapefruit. I made enough of the cream/yogurt mixture to keep some in the refrigerator so that I can make these quickly whenever we want them. I think they would be great served for brunch, too. 1. Position oven rack about 3 inches below the heat source; preheat broiler. Line a rimmed baking pan with foil. 2. Cut each grapefruit in half, then trim a thin slice off the bottom so it sits level. With a paring knife, or grapefruit knife, cut around each segment, remove any seeds. Place the grapefruit halves in the prepared pan. Combine brown sugar and cinnamon (or cardamom) in a small bowl. Brush each half with melted butter, then sprinkle with about 2 teaspoons of the sugar mixture. Brushed with butter and sprinkled with brown sugar. 3. Broil the grapefruit, watching carefully and rotating the pan once halfway through, until the tops are bubbling and golden brown, 7 to 12 minutes. 4. Meanwhile beat the cream in a small bowl until stiff. Beat in yogurt, granulated sugar and vanilla just until combined. 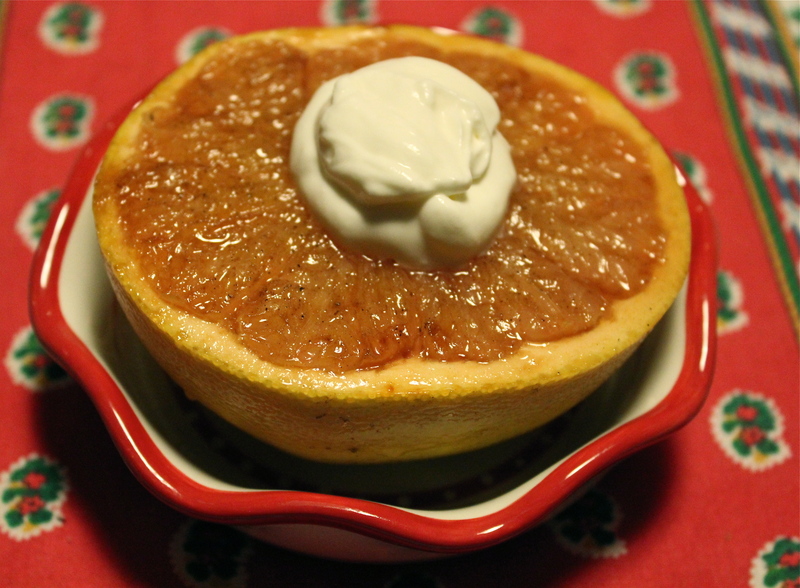 Serve each grapefruit topped with a heaping tablespoon of the vanilla cream. Top grapefruit with vanilla cream. Since I went a little hog-wild at the supermarket and purchased a lot of different forms of citrus fruits, now I’m in the situation of trying to use them in as many ways as possible. Eating them peeled and sectioned “out of hand” and in fruit salads is a given. 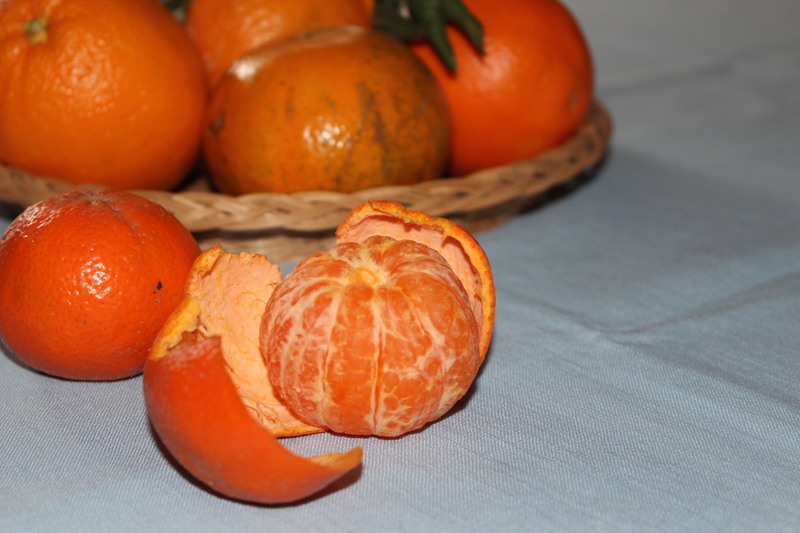 A tangerine, a Mineola, or a clementine make a quick snack any time. 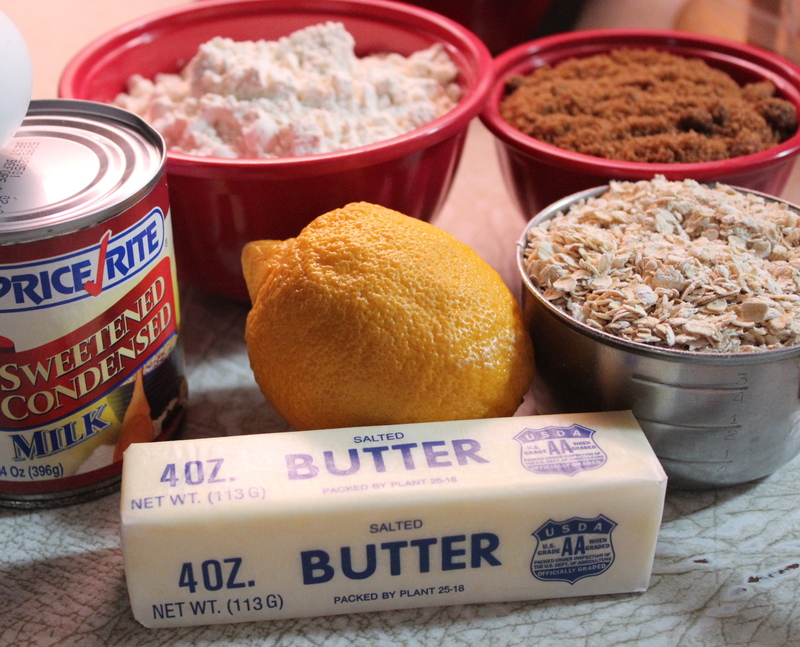 I’ve already shared with you my recipe for Lemon Cream Squares here, so this week I will be featuring recipes that contain other forms of citrus. One of the recent dinners I made was this one, Soy Maple Salmon with Roast Cauliflower. Even though you see no mention of a citrus in the title it’s there none the less, in both the salmon part and the cauliflower. We thought this meal was fabulous and one that I want to repeat again soon. 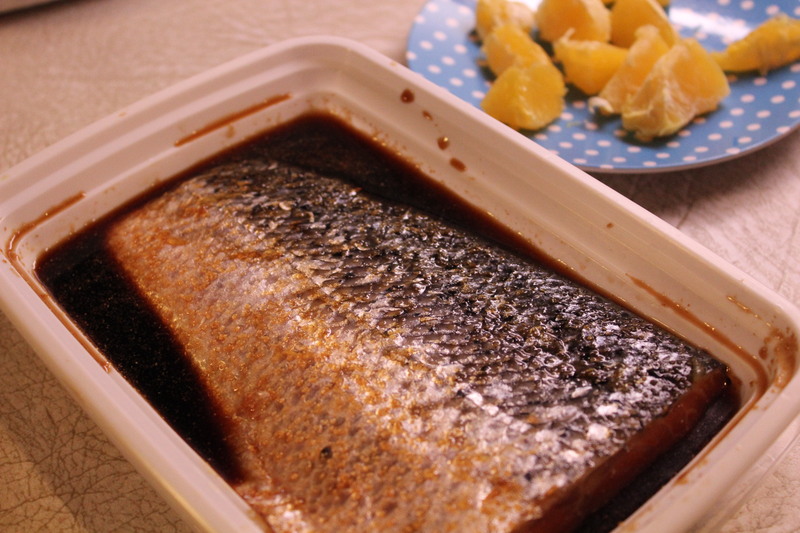 During this season when seafood is also plentiful, I try to prepare a fish item at least once per week. The total calories for these two items is under 400 calories, and only 18 Gm. Carbohydrate. There is a bargain of goodness in this meal any way you look at it. In planning my time to prepare this meal I found that if I roasted the cauliflower and made a salad while the salmon was marinating, I could then pop the salmon in the hot oven, finish the cauliflower dish and dress the salad. 1. Mix all the ingredients (except salmon) plus 2 Tablespoons water in a large bowl or zip-lock baggie. Add the salmon and turn to coat. Allow this to marinate in the refrigerator for about 20 minutes. 2. When ready to cook, preheat the oven to 400*F. Coat a rimmed pan with cooking spray. Drain the fish, season with salt and pepper and place on the prepared baking sheet. 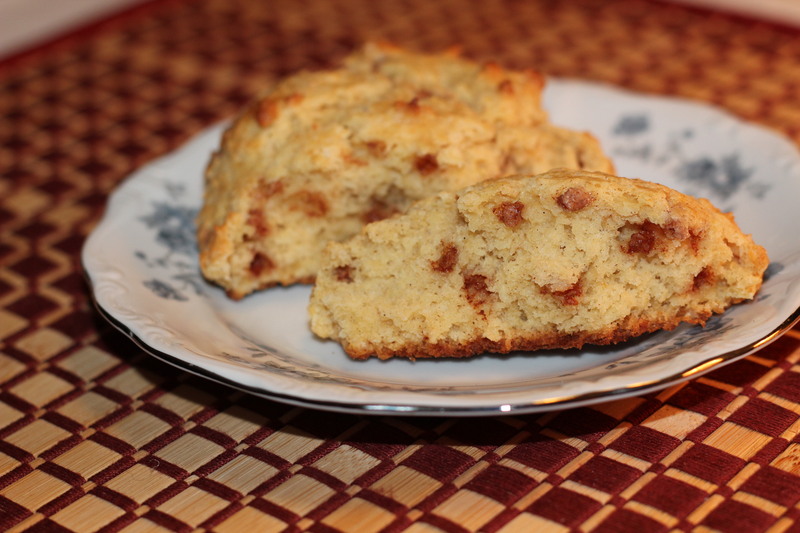 Bake until slightly golden and beginning to crisp around the edges, 8 – 10 minutes. 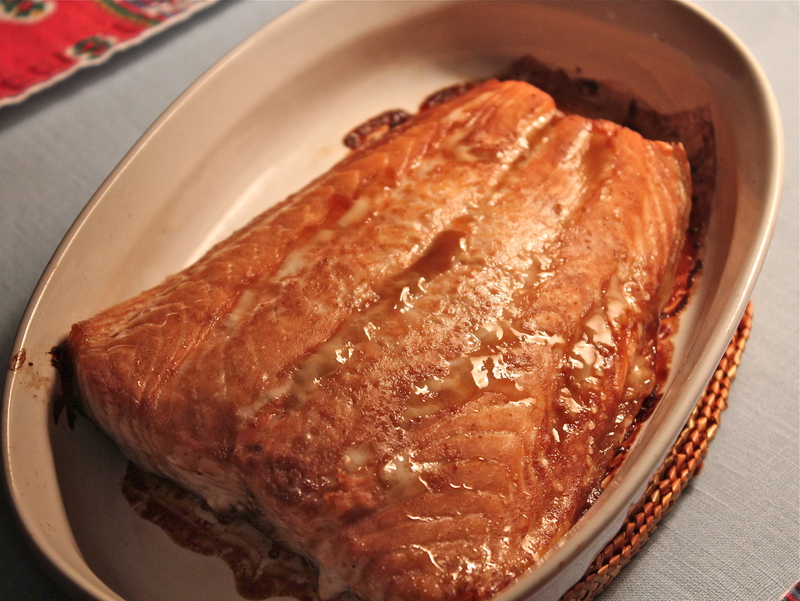 The salmon should be moist, and flake easily with a fork. 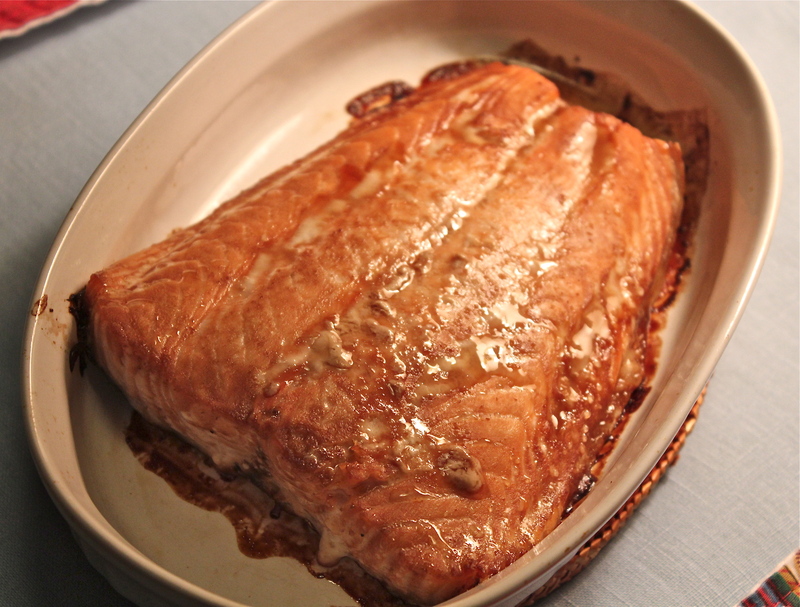 Note: Salmon will be baked after cauliflower at a lower oven temperature. 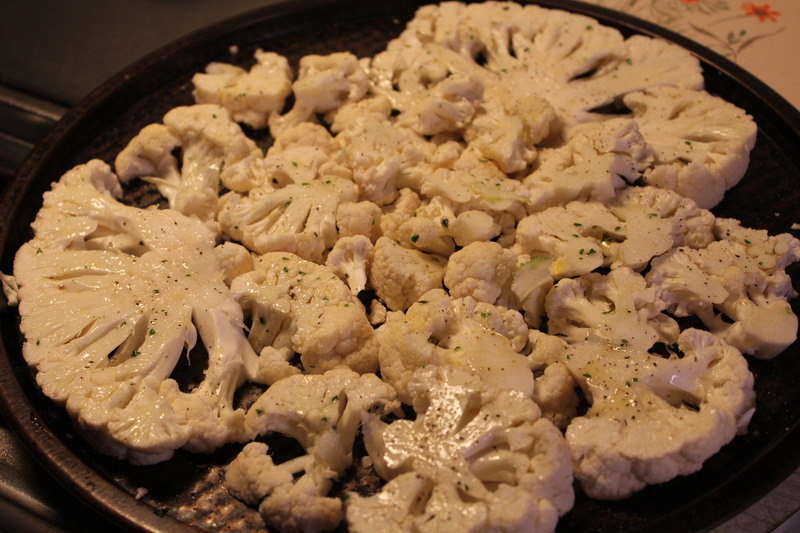 Cauliflower brushed with oil and ready for the oven. 1. 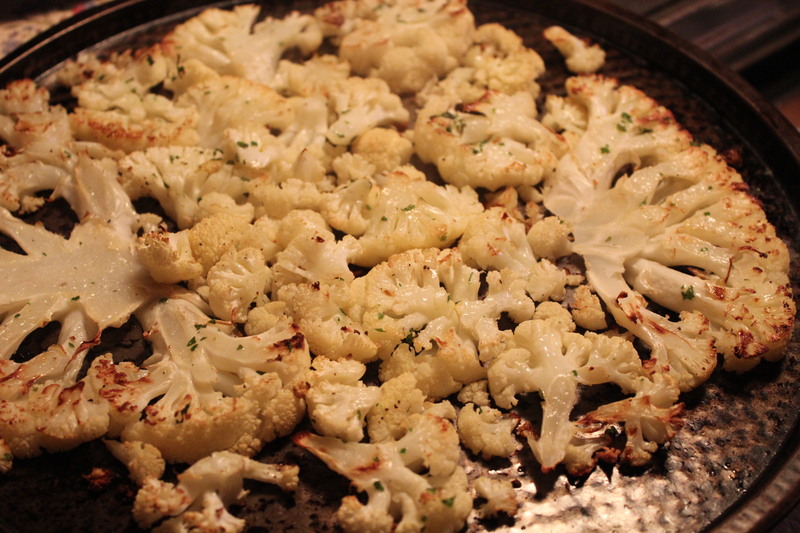 Preheat oven to 450*F. Arrange cauliflower on a rimmed baking sheet in a single layer and brush with 2 Tablespoons olive oil. Season with salt and pepper. Roast, flipping once, about half way through cooking time, until tender and a little charred at edges, about 25 minutes. 2. Transfer to a serving platter with clementine segments and cover with foil to keep warm. Turn down oven heat to 400*F to cook salmon. 3. In a small saucepan, heat the remaining 1 Tablespoon olive oil, add the cranberries, pistachios, clementine zest, and a little salt and pepper to taste. Stir to heat through. 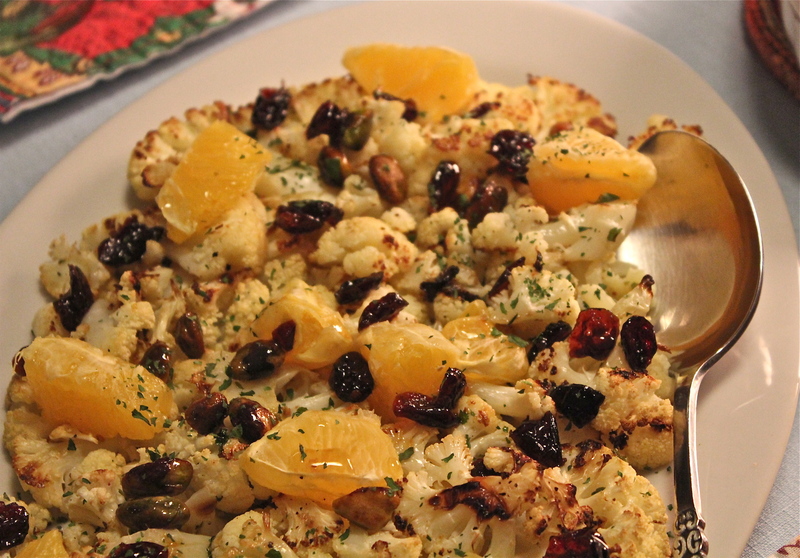 When ready to serve, drizzle over the cauliflower and clementines. Sprinkle with chopped parsley. This dinner entree is a mash-up of two recipes that I put together with some major modifications. I’m thinking green, people. I don’t mean environmentally green as in recycle, reduce, reuse or regift. I mean the color green, as in grass, spring, shamrocks, emeralds, (woo-hoo, my birthstone!). What got me thinking along these lines was a display of fresh asparagus at the supermarket. This vegetable says spring to me like no other so I had to buy some. And then the question, ‘what shall I make with it?’ I pondered: roast asparagus? steamed asparagus with butter sauce? asparagus with eggs? No, even though I like all those dishes, I wanted something more substantial that would make a whole meal. So, remembering that I had a bag of frozen shrimp in the freezer, ( remember my resolution not to forget about foods in the freezer?) 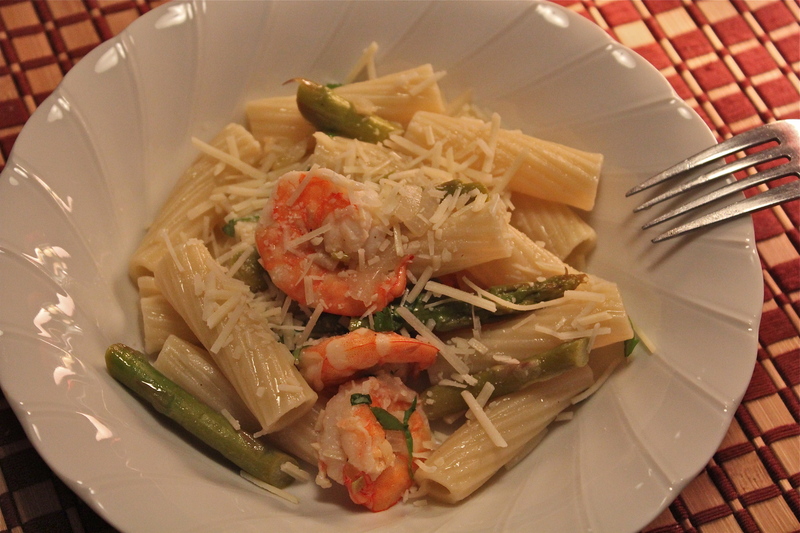 I decided on the following recipe for Penne with Asparagus and Shrimp. 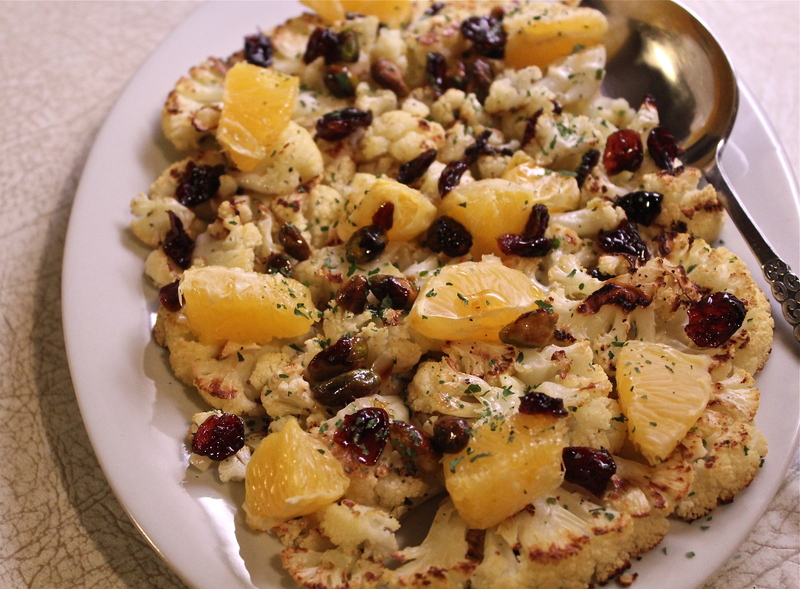 This is a healthy, hearty, yet easy recipe that is good enough to serve to guests. It also makes a great take-along lunch for the next day. 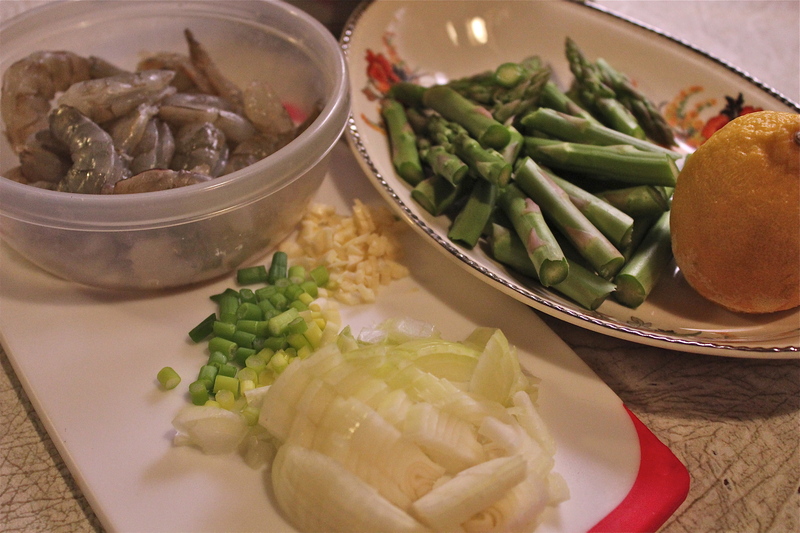 Beautiful green asparagus, shrimp, onions and garlic. 2. Meanwhile, heat the olive oil in a large skillet over medium heat. 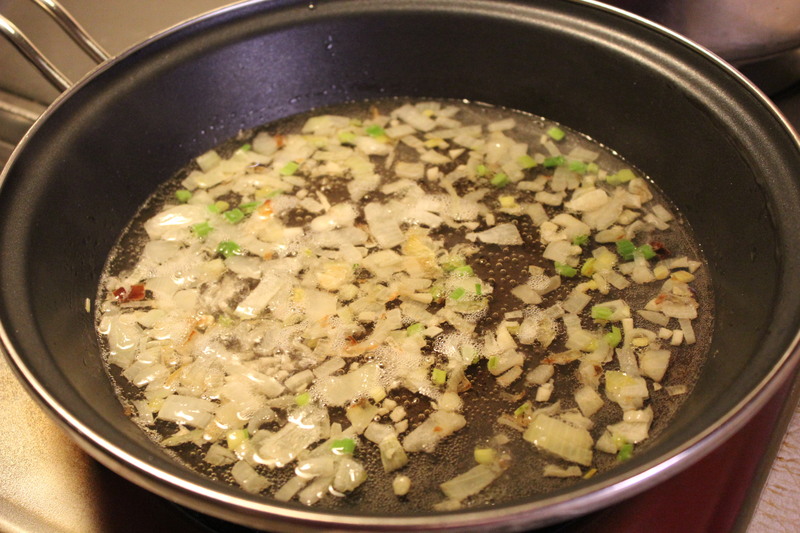 Stir in the garlic and onion, and cook until the onion has softened and turned translucent, about 5 minutes. White wine, butter and asparagus added. 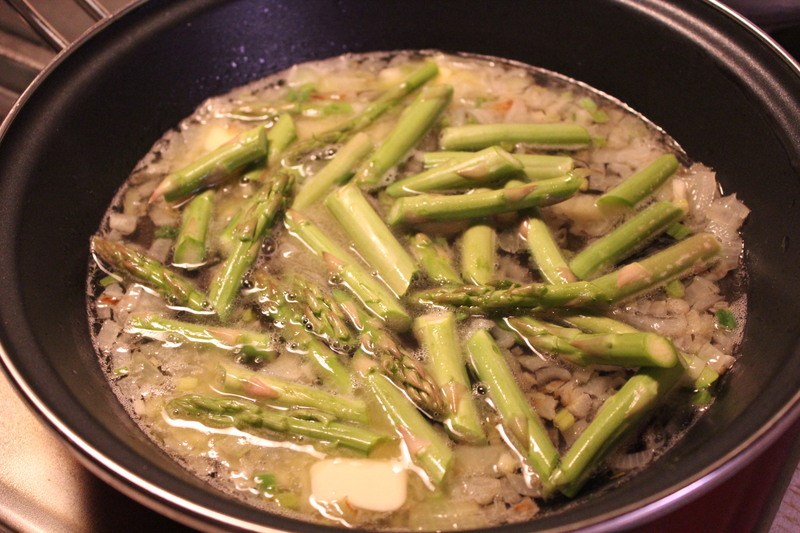 Cook until the asparagus is just tender, about 3 minutes. Add the shrimp and lemon juice, continue cooking until the shrimp have turned pink and are no longer translucent in the center. Season with salt and pepper. 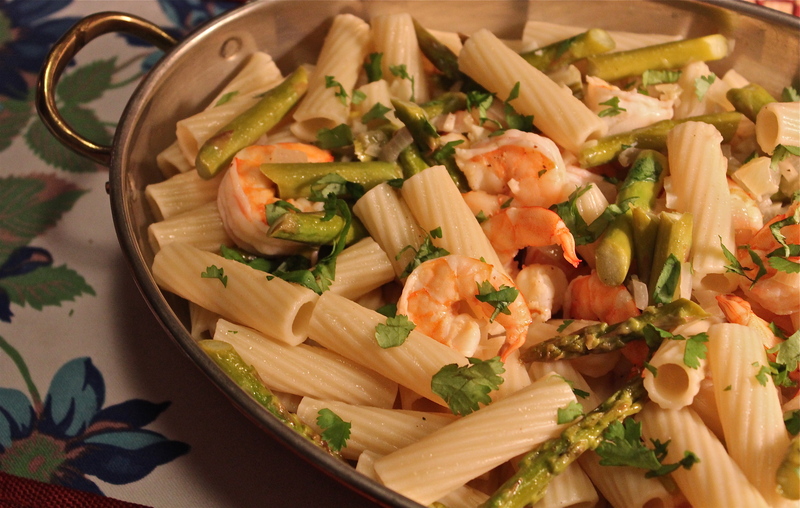 Shrimp, lemon juice, and then pasta added. 4. 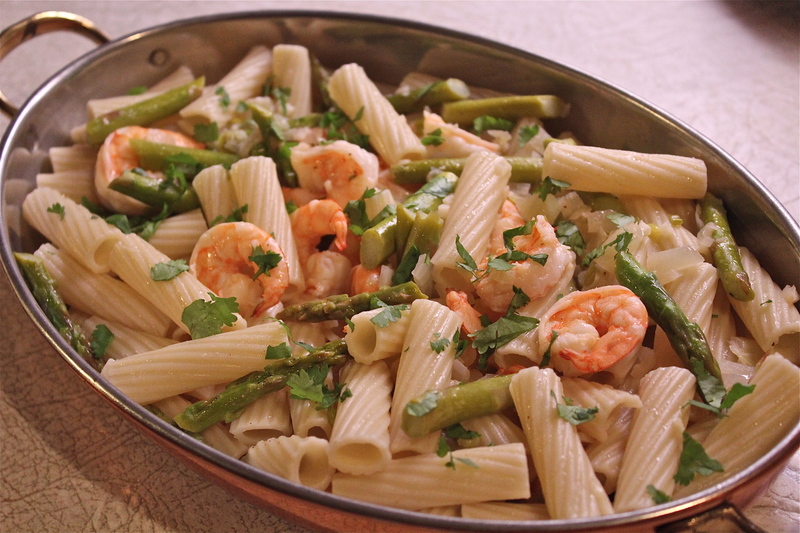 Toss the cooked penne pasta with the shrimp and asparagus mixture. 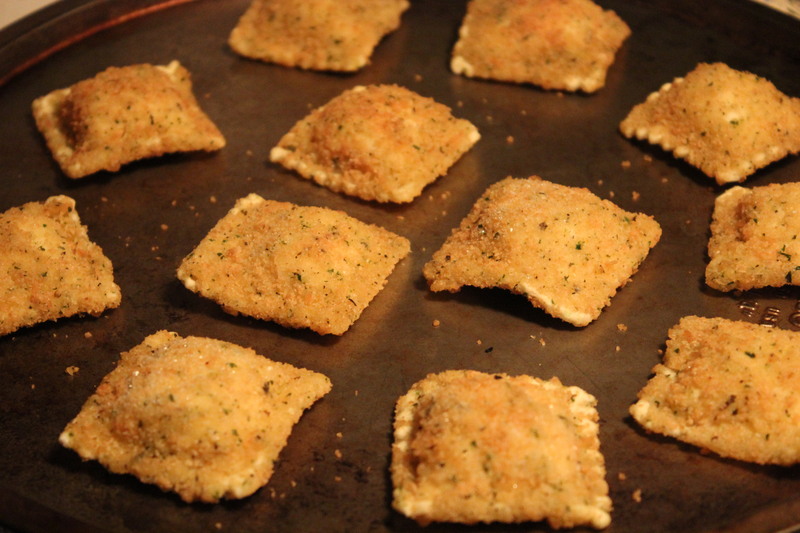 Sprinkle with parsley and Parmesan cheese to garnish. Sprinkle on more Parmesan cheese. 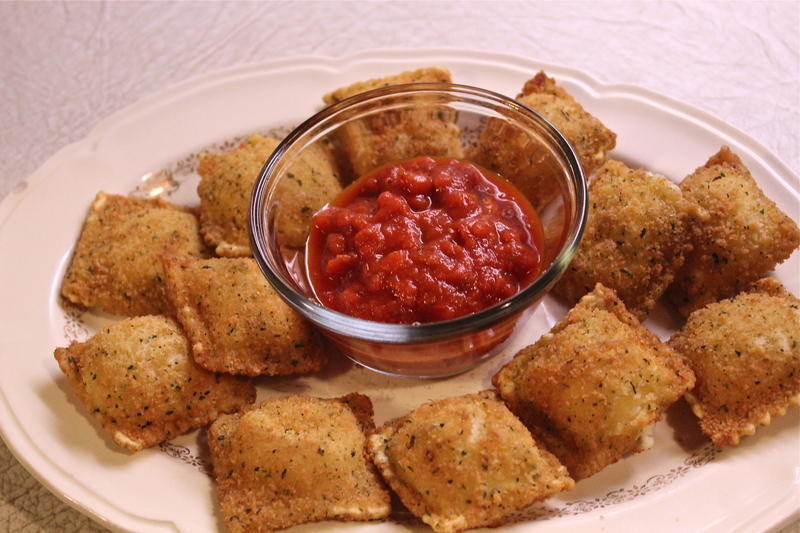 Serve with more parmesan cheese at the table to sprinkle on each serving. We are growing tired of winter winds whipping, snow piled up in hugh mountains, and very little green(ery) to be seen. 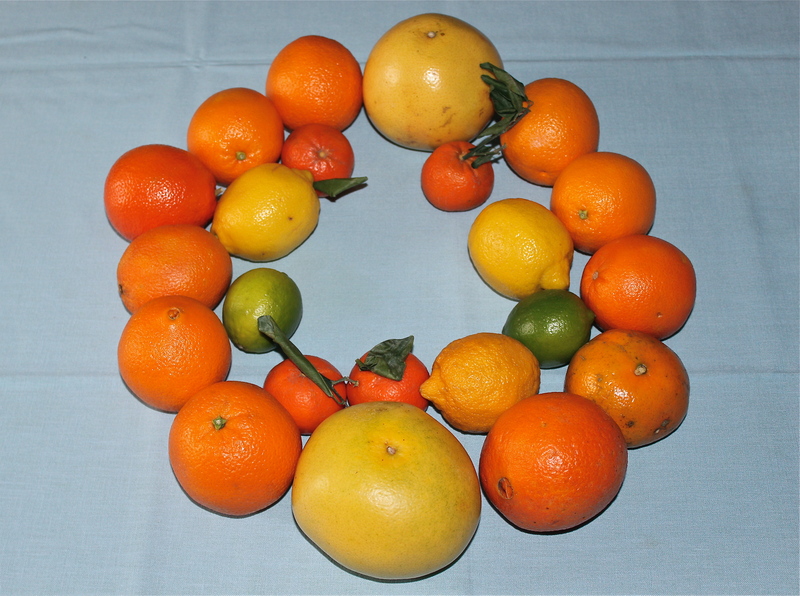 So along comes a breath of sunshine in the form of citrus fruits to remind us of warm weather and sunnier times. The bright colors of oranges, lemons, limes, and grapefruits, are so cheerful, and they show up in the produce isles just when we need them most. I don’t know about you, but I am ready for a little warm weather fling. Citrus fruits are an equal opportunity ingredient, happy in either savory dishes or sweet. For example, I use orange segments in green salad to brighten it up and give the salad a little interest and of course I bake with citrus, especially lemons. This post is not going to be using words like zippy, zingy, tangy and tart to describe the flavors of citrus. You don’t need me to tell you what a lemon tastes like, or how frequently a recipe calls for lemon juice. In fact I don’t know of a cuisine that does not use citrus in one way or another. It’s the citric acid that brightens food and makes it come alive. Often its there, you don’t know it, but it provides balance. 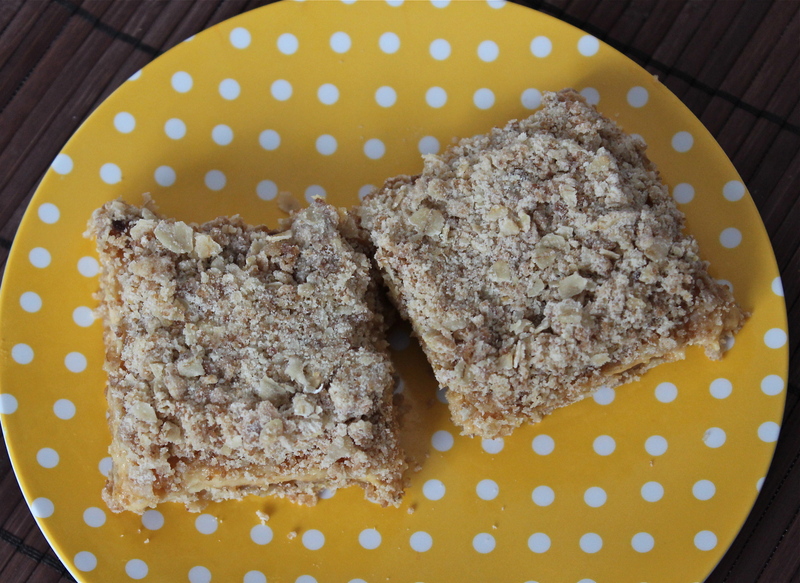 One of my favorite uses for lemons is to make lemon squares. With the abundance of all this citrus, I decided to indulge myself and make a batch. 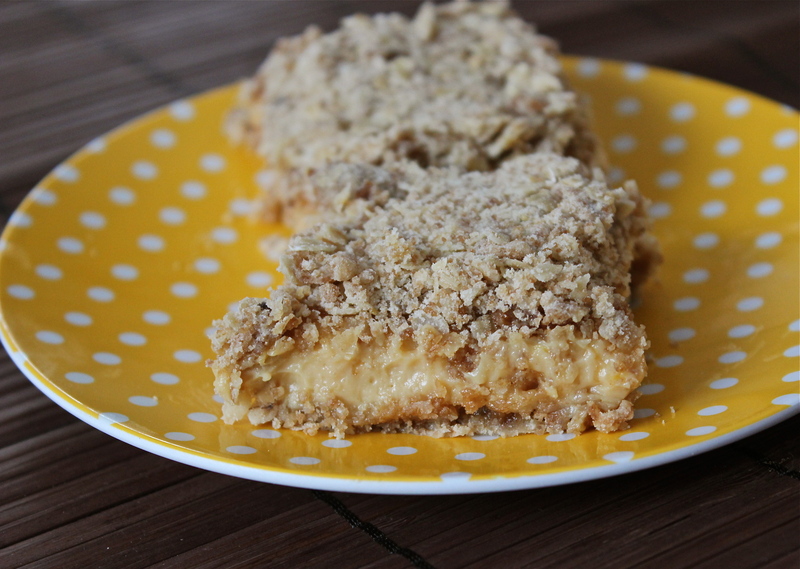 This recipe uses oatmeal as one of the ingredients in the cookie base and the topping, so you get a nice little crunch in every bite. 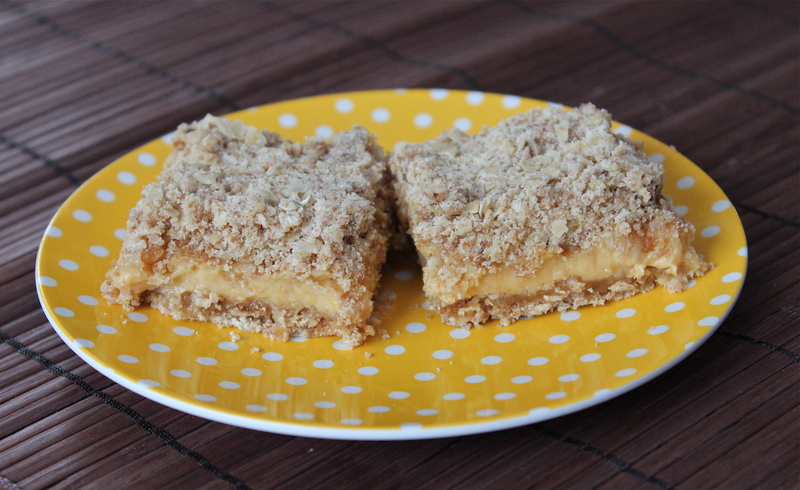 Paired with the smooth creaminess of the lemon filling, this makes a very satisfying dessert or snack. 2. In a large bowl cut butter into brown sugar until they are well combined. 3. In a separate bowl, whisk together the flour, salt and baking powder. Add this mixture and the oats to the butter mixture and mix to combine. This will be quite dry and crumbly. 4. 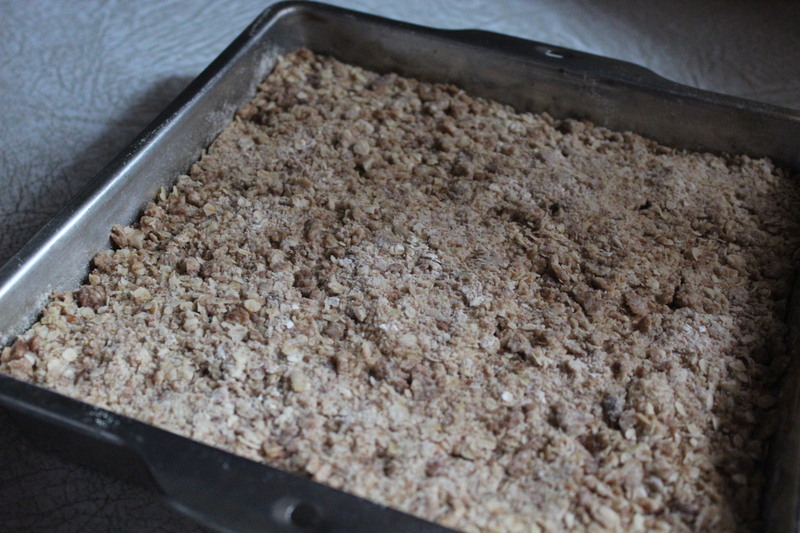 Press half the crumb mixture into the bottom of the prepared pan, and press down lightly. 5. In a small bowl mix together the condensed milk, lemon juice and zest. Spread evenly on top of the oat mixture in the pan. 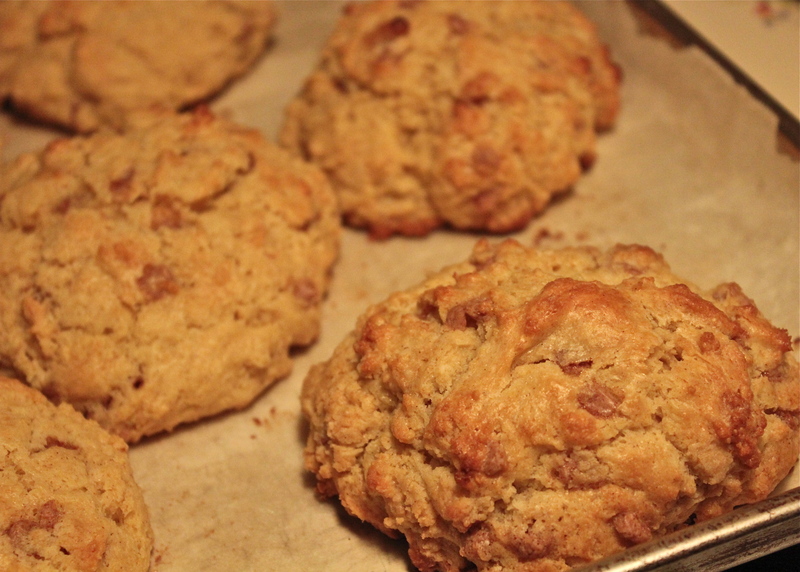 Top with the remaining oat mixture. 6. 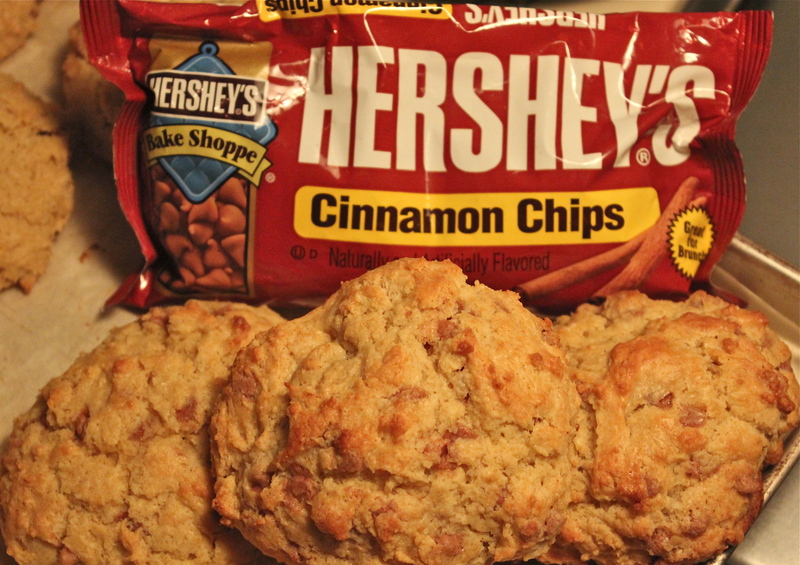 Bake for 20 – 25 minutes or until the top is golden brown. Let cool and refrigerate for 30 minutes or until set. Cut into bars and store in the refrigerator. I didn’t know what “Yakitori” was, since I had never had it, but I was willing to experiment with a new recipe. The title was intriguing, and besides that it promised to take only 20 minutes cooking time. On a Friday evening I’m usually looking for a quick-to-fix meal and this one seemed to fit the bill. 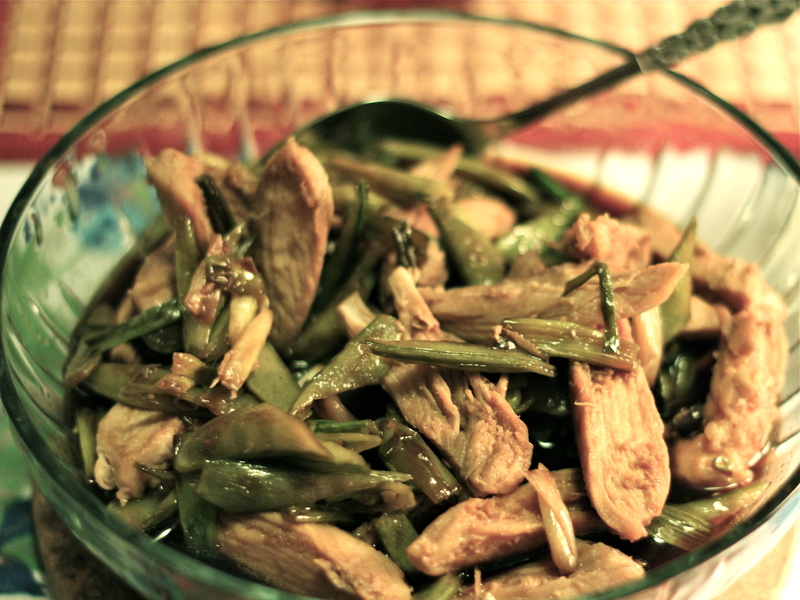 I glanced at the recipe initially and knew that I had everything on hand that it called for with the exception of snow peas, so while I was out doing some errands, I stopped at the market to get some. Snow peas are tender and crisp, some with tiny peas inside the shell, but they do have a tough “string” along the side that needs to be pulled off. So to prepare them for the recipe, you need to wash them, then remove the tips and the string. Then each one gets cut in half lengthwise. Snow peas, trimmed and cut diagonally lengthwise . The bunch of green onions called for also need to be cut into 1-inch pieces. Therefore you need to plan for some prep time for the vegetables. Once all that is done the rest goes together quickly. The seasoning in this dish is achieved thru the use of Asian ingredients; soy sauce, mirin (sweet rice wine), rice vinegar and peanut oil. Together they make a pleasant flavoring that is very enjoyable. Mirin is low in alcohol content, and most of it cooks off in this recipe. For a non-alcoholic version, substitute an equal amount of chicken broth and another tablespoon of rice vinegar. 1. Cook rice according to package directions, omitting salt and fat. 2. Combine soy sauce through chicken broth in microwavable bowl. Heat on HIGH for 1 minute to dissolve sugar. Stir, and set aside. 3. Heat a large non-stick skillet or wok over medium heat. Add 2 teaspoons peanut oil to pan; swirl to coat. Add chicken pieces to pan; cook for 3 minutes on each side or until browned. Transfer to a cutting board; cool slightly. Cut into ( 1-inch ) strips. 4. Return pan to medium-high heat; add remaining 1 teaspoon oil to pan. Add snow peas and onions; sauté 2 minutes. 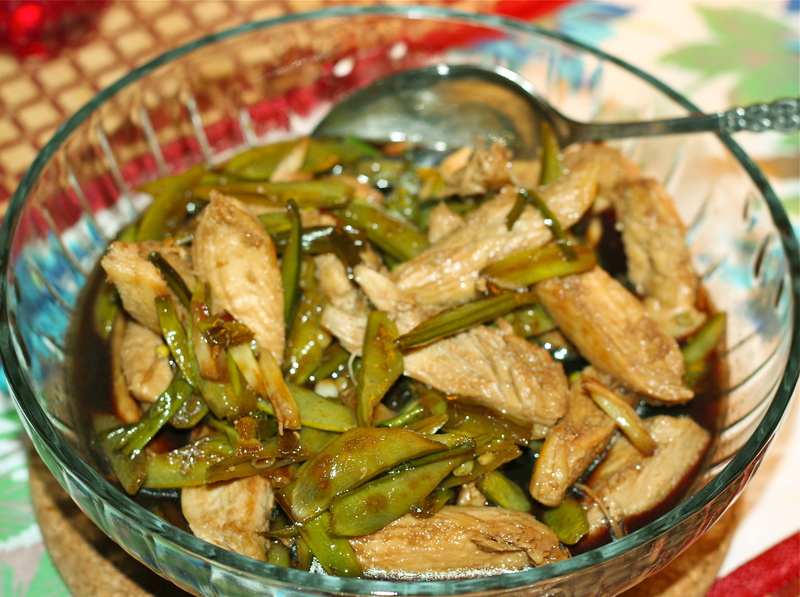 Saute snow peas and onions. Add in chicken pieces and soy sauce mixture. 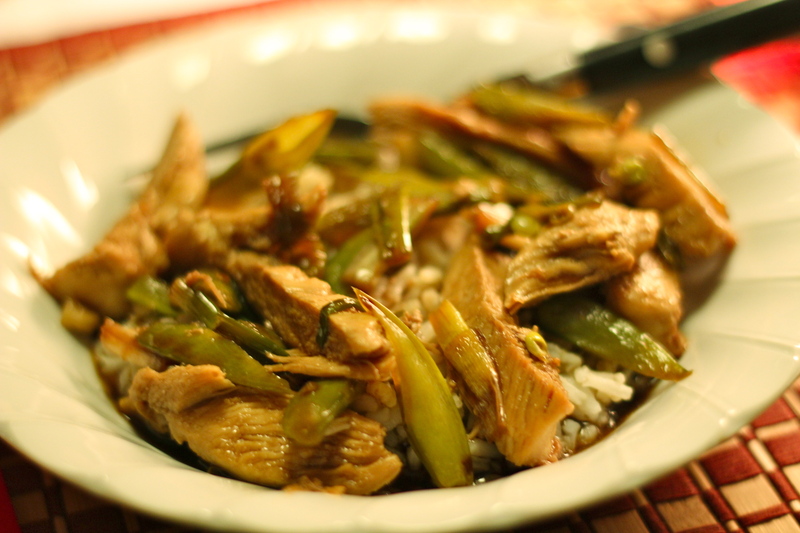 Cook 2 minutes or until liquid is syrupy and chicken is throughly cooked, stirring frequently. 5. To serve, place 1 cup rice in each of 4 shallow bowls; top each serving with 1 cup of chicken mixture. 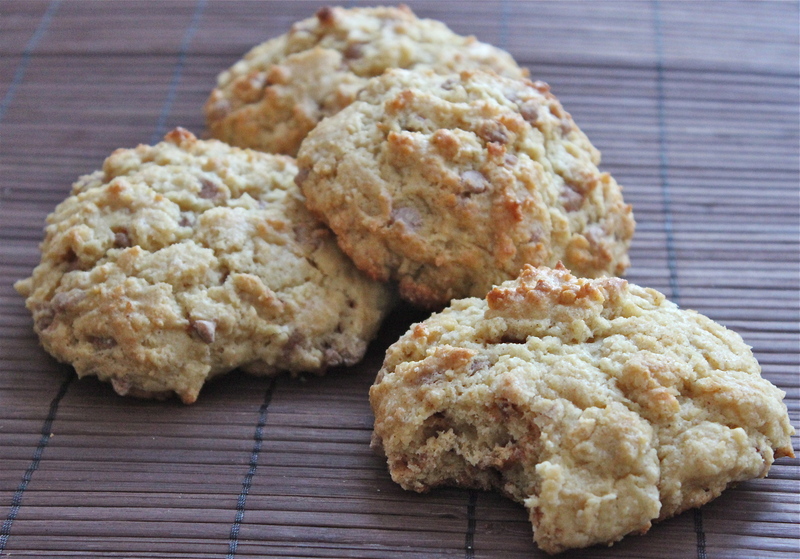 Our assessment of this recipe? Both of us liked it well enough for me to make it again. I am not generally fond of main course foods that are sweet. So for me, it was a little too sweet. Next time I will reduce the sugar to 2 Tablespoons from the 3 called for and I will probably add some matchstick cut carrots to the mix, just to get in another vegetable and for more color. With some advance planning; i.e. prepping the vegetables the night before and keeping them refrigerated, this meal will go together quickly. In the time it takes to cook the rice, you can have the chicken skillet made. We really like quesadillas, but for me they don’t hold enough food or variety of food to feel like I’ve eaten a whole meal, To remedy that situation I combined some typical foods found in TexMex dishes with south-western seasonings and flour tortillas into a casserole and baked it. That provided us with a satisfying, filling meal with all the flavor and cheesiness you would expect. I got the idea for this from a recipe on the back of a package of McCormick seasonings. This is what we had for dinner on Super Bowl Sunday. My husband commented that he hoped I would make it often because it contained every thing he likes into one casserole dish. The product I used for the seasoning is one put out by McCormick Spices. It is a little card with small amounts of different spices needed for a recipe. The recipe is printed on the back so that you can pick up any other ingredients you made need while you are at the grocery store. The spices used here are pretty commonly found in most kitchens so you may already have them. I know I did but I wanted to try the recipe so I bought the card. 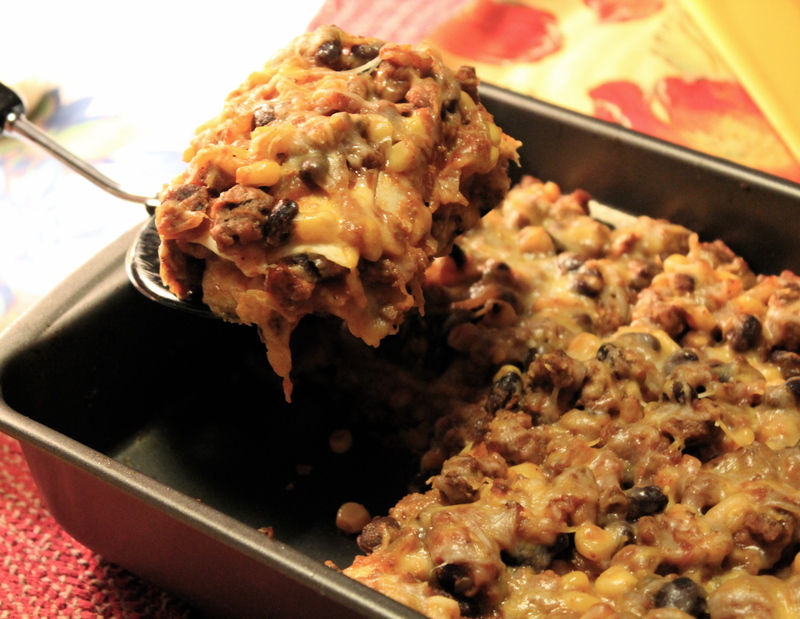 The casserole turned out to be quick to make and really good! 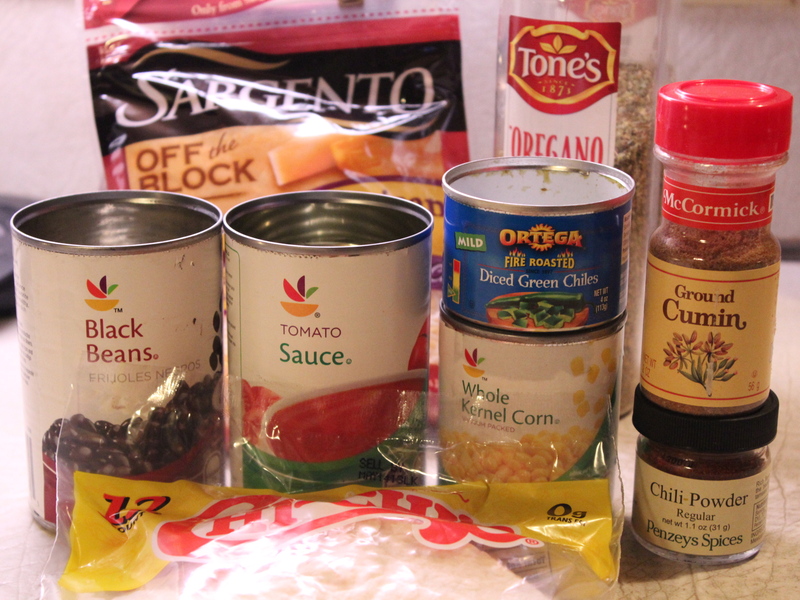 You just need a few cans of vegetables; black beans, corn and green chilies, and a large can of tomato sauce. 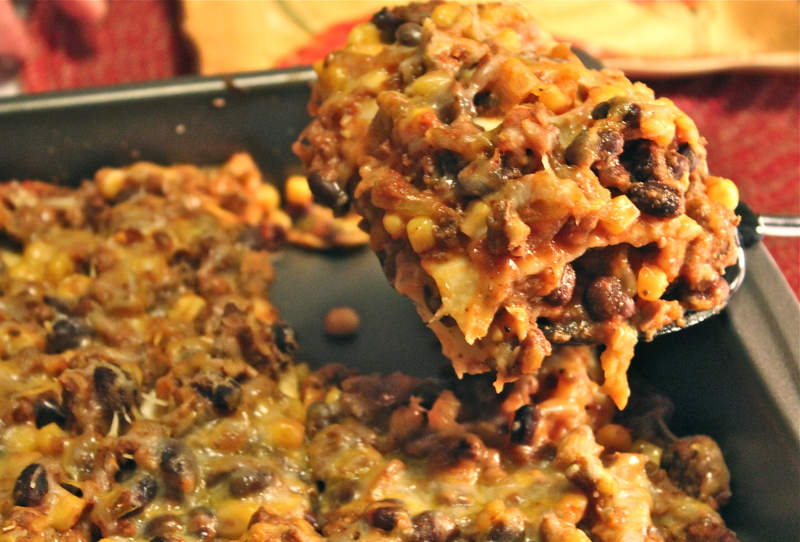 Add a pound of ground beef, flour tortillas and some cheddar cheese and you will be all set to make an ooey, gooey, cheesy dish of yumminess. 1. Brown beef and onion in a large skillet on medium high. 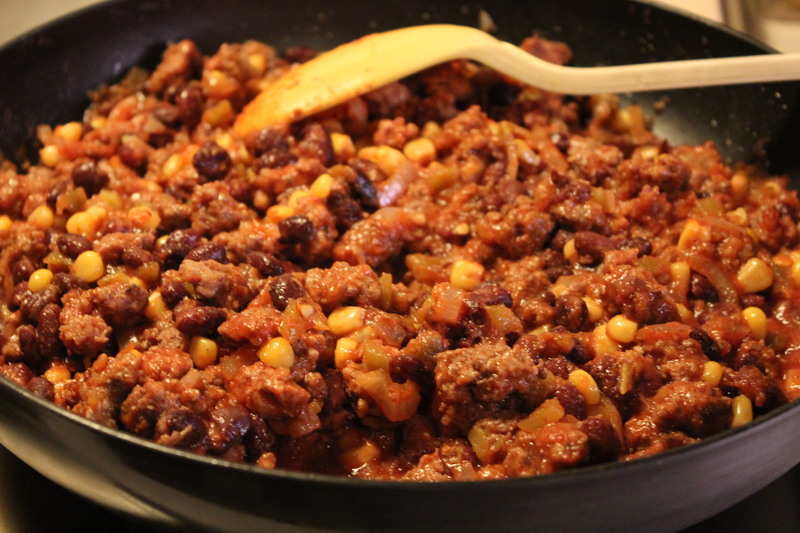 Add tomato sauce, beans, corn and green chilies. Mix well. Stir in all of the spices except the red pepper. Bring to a boil, reduce heat to low and simmer 5 minutes. Add red pepper if desired. Combine meat, vegetables, and spices in a large skillet. 2. 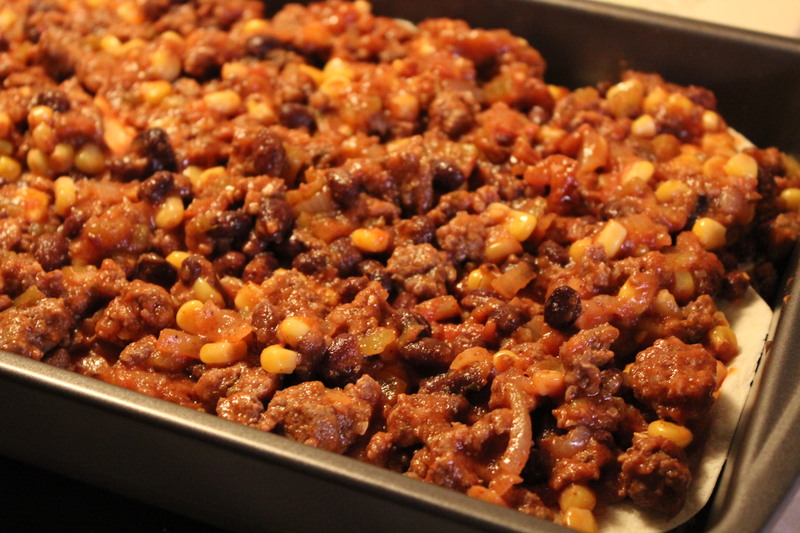 Spread 1/2 cup of the beef mixture on the bottom of a 13 x 9″ pan, previously sprayed with non-stick spray. Top with 3 of the tortillas, overlapping as needed. 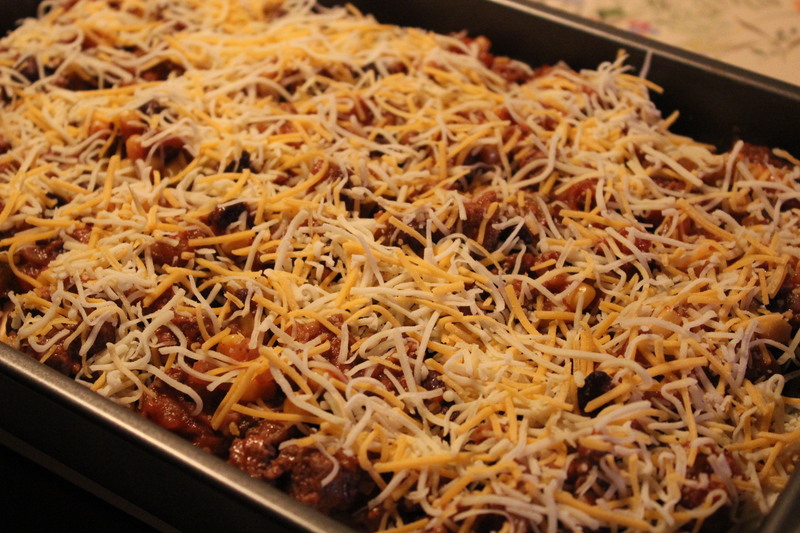 Layer with 1/2 of the remaining beef mixture and 1/2 of the cheese. Repeat with remaining tortillas, beef an cheese. 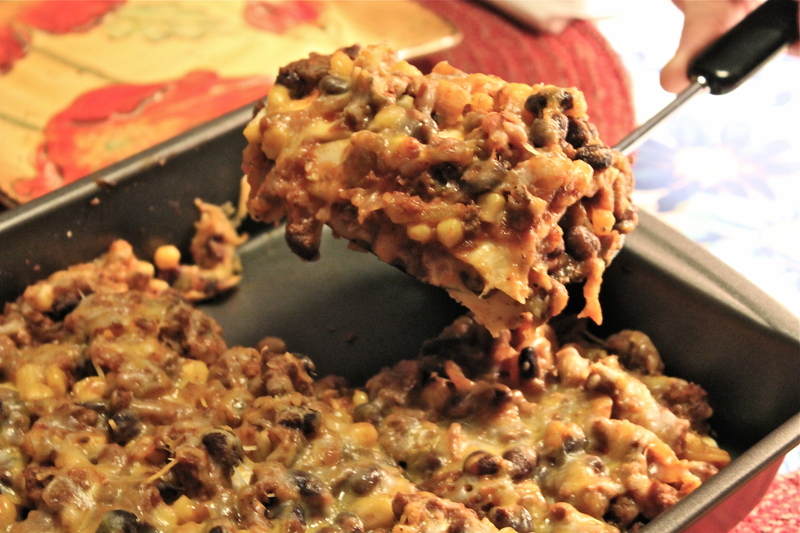 Layer in baking dish with tortillas and cheese. 3. Bake at 350*F. for 15 – 20 minutes till heated through and bubbly. Let stand 5 minutes before serving. Top with sour cream and guacamole if desired. 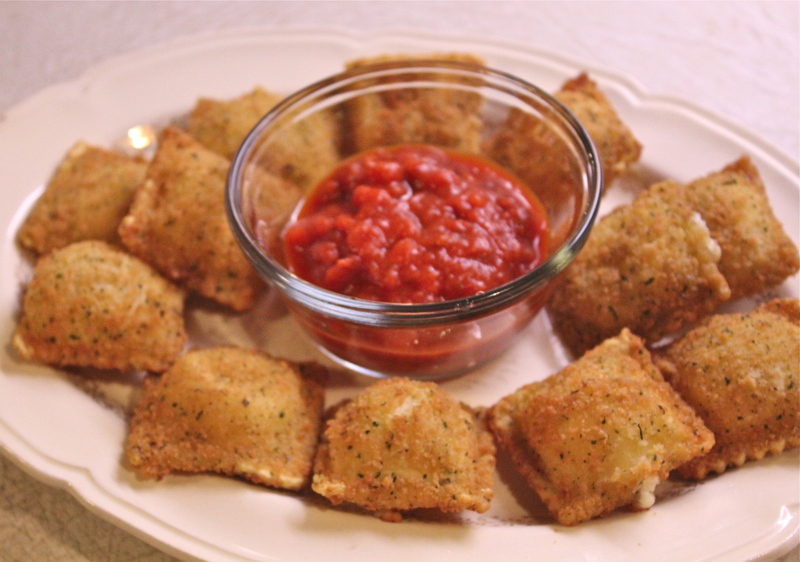 Serve it up, fragrant, cheesy and delicious.